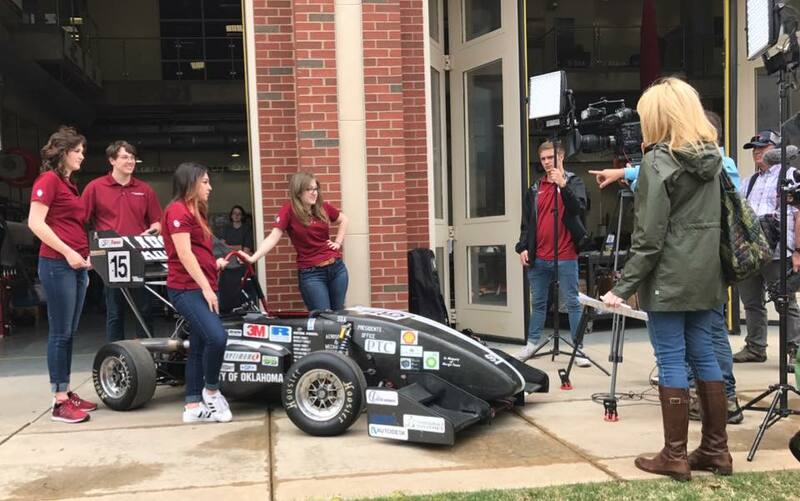 Sarah Ciccaglione, an aerospace engineering student, was featured in the “Crimson Spotlight” segment of the Inside OU newsletter on March 13, 2019. In the video, she speaks about her involvement at OU and how the School of Aerospace and Mechanical Engineering has made her feel at home. Ciccaglione is a member of the Sooner Racing Team. She enjoys the mechanical systems behind the cars and competing with her team. Ciccaglione is interested in the technical side of aerospace engineering and she enjoys the math and science involved in her major. Furthering her career in the engineering field, she also got the opportunity to intern with Tesla in Palo Alto, California. Ciccaglione is very involved on campus. She is a member of the rowing team and double majors in aerospace and vocal performance. Ciccaglione loves all of the opportunities that OU provides for its students and the support system she has gained. Click here to watch the Crimson Spotlight video featuring Sarah Ciccaglione. 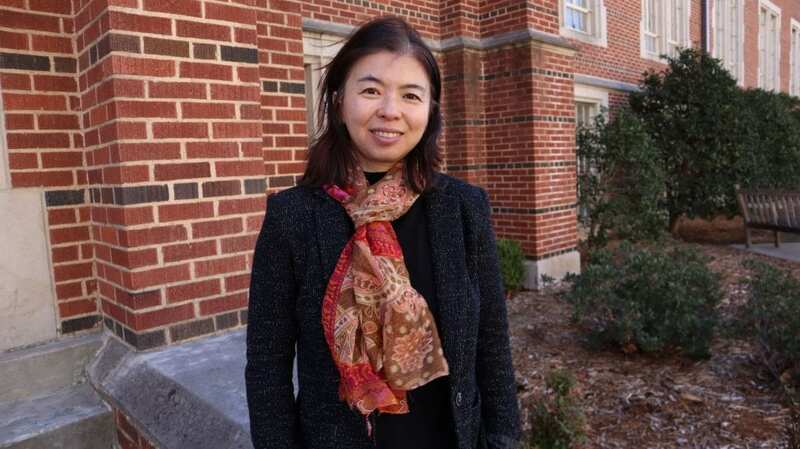 Dr. Li Song, an associate professor at AME, received three awards for her current research projects. Two awards are from the Department of Energy, and the third award is from Battelle – Pacific Northwest National Laboratory. Song is the lead PI for the development and validation of a home comfort system for total performance deficiency/fault detection and optimal control project, which received a DOE fund of $993,149. The research team will develop and validate a smart thermostat-integrated low-cost home energy management system, including a data connection framework; a computationally efficient, self-learning home thermal model; automatic fault detection and analysis algorithms; and home energy management information and controls based on in-situ measured efficiencies of heating and cooling equipment, the air distribution system, and the building envelope. The second DOE fund is $551,566 for the performance demonstration of an occupancy sensor-enabled integrated solution for commercial buildings project. The research team will validate the performance and savings of three HVAC control (fan, cooling coil valve, outside air) algorithms integrated with occupancy sensing data to optimize ventilation delivery. 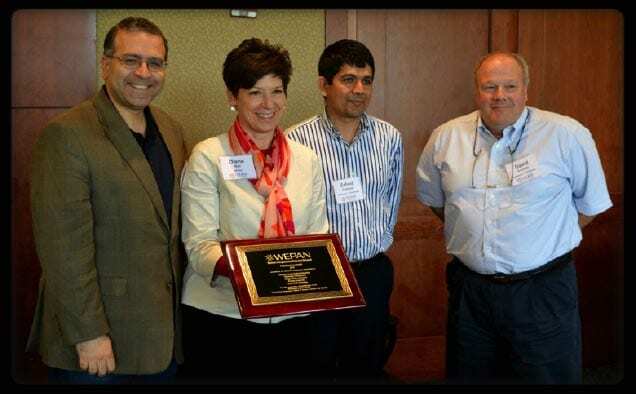 A $50,000 award was given to Song from Battelle – Pacific Northwest National Laboratory for her Transactive-Control Based Connected Home Solution for Existing Residential Units and Communities project. This is a summary of Song’s research proposal sent to Battelle: To obtain the overall project aims, the development of machine learning techniques to calibrate the initial physical model that estimates and predicts energy use of a house and its response to control signals is extremely important. An effective home thermal model, that can predict the indoor air temperature dynamics under different weather, HVAC output and internal gains from appliances and occupants, is essential for the development. BEEL initiated the development of a self-learning home thermal model two years ago. The BEEL home model, currently limited for a house with an A/C and gas-furnace heater, can automatically identify the model parameters with minimum data needed and precisely predict the space temperature and home HVAC energy uses for a house. To enhance the connectivity and compatibility of the platform proposed by PNNL, BEEL is committed to expand the home thermal model for a heat pump system and test enhanced home model using two houses located in Oklahoma through the partnership with OG&E. The challenge of modeling the heat pump is that the heating output from a heat pump is no longer constant as is for a gas furnace heater. A correlation of the heating output of a heat pump and outdoor air temperature needs to be formulated and similarly, a correlation between cooling output of a heat pump and weather might be needed for cooling season as well. 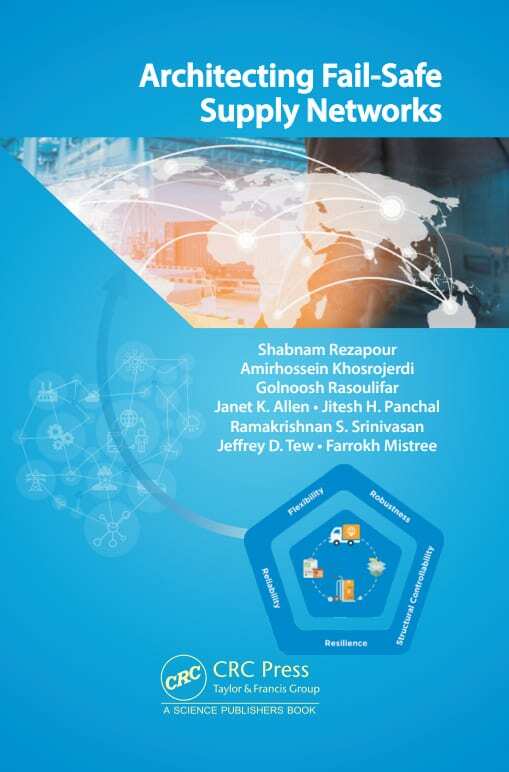 AME and ISE researchers Farrokh Mistree and Janet K. Allen released a monograph containing a fail-safe supply network that is designed to mitigate the impact of variations and disruptions on people and corporations. Mistree and Allen co-direct the Systems Realizations Laboratory at OU, which focuses on collaborative research in intelligent decision-based realizations of complex social systems. Ultimately, this work is aimed at educating strategic engineers. In this monograph, they propose a framework, develop mathematical models and provide examples of a fail-safe supply network design. This is achieved by developing a network structure to mitigate the impact of disruptions that distort the network structure and planning flow through the network to neutralize the effects of variations. The researchers asses current thinking at different levels of management within a network. The strategy revolves around 5 elements: reliability, robustness, flexibility, structural controllability, and resilience. Organizations can use the framework presented in this monograph to manage variations and disruptions. Managers can select the best operational management strategies for their supply networks considering variations in supply and demand and identify the best network restoration strategies. The framework is generalizable to other complex engineered networks. AME was one of the selected schools to be featured on the TECAID Webiste with WEPAN. 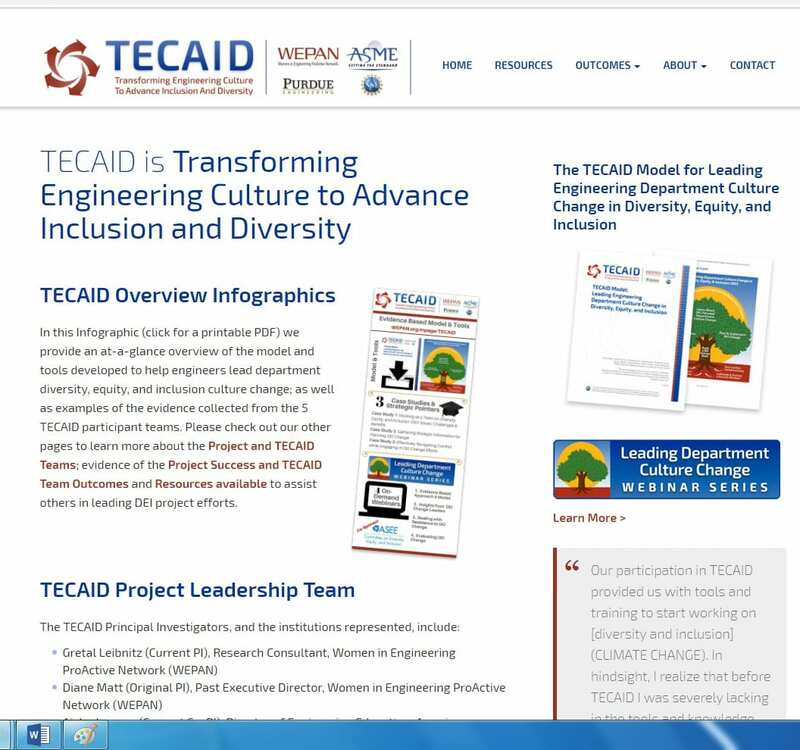 This website focuses on transforming engineering culture to advance inclusion and diversity. TECAID is an active program in which engineers can learn about the environment they are in, while learning about their skills and knowledge. They focus on how to create the best personalized experience for their engineers. We would like thank Phil Dineen who served as TECAID’s web designer and ASME who provided funds to make these final updates possible. 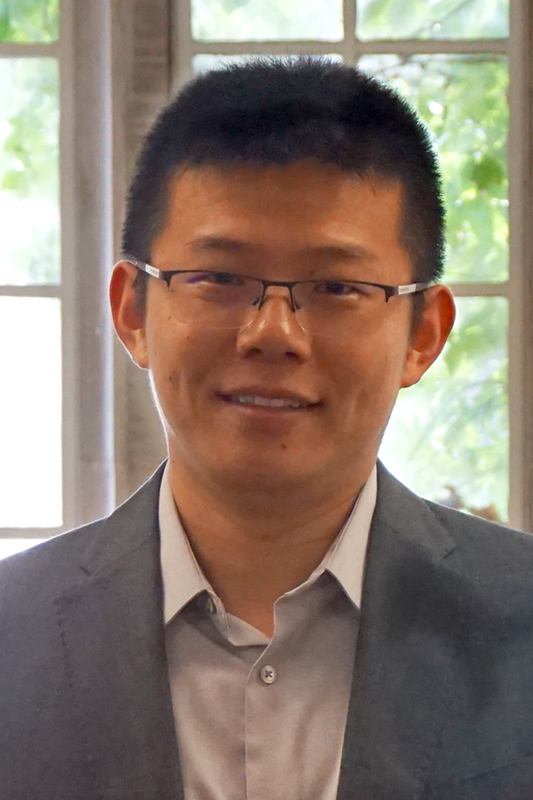 The School of Aerospace and Mechanical Engineering is excited to announce our new faculty member, Dr. Jie Cai. Dr. Jie Cai holds a bachelor’s degree in Mechanical Engineering and a master’s degree in Mathematics. In 2015, he obtained his Ph.D. from Purdue University with a focus on multi-agent control for building energy system management. Prior to joining OU, Dr. Cai was a postdoctoral research associate with Ray W. Herrick Laboratories at Purdue University and also held a 50% appointment with the National Renewable Energy Laboratory. Within the postdoc appointment, he has been leading several industry- and DOE-funded projects related to whole-building fault detection and using building energy systems for power grid ancillary services. His research focus has centered around modeling and advanced controls of building energy systems and their broad applications, including grid-interactive building operation, optimized control for variable-speed air-conditioning/heat pump systems, distributed control of sustainable communities, etc. He is excited about joining AME at OU and he is looking forward to working with the students, staff and other researchers at OU in establishing a vigorous building energy research program. He is hoping to see that the research work to be carried out at OU will contribute to a more sustainable and resilient society. OU is a diverse community offering excellent opportunities for interdisciplinary collaboration and it has close physical proximity to leading HVAC manufacturers. What are you most looking forward to working at OU’s AME? Working with the smart students, supportive staff members and world-class researchers to establish a vigorous research program. Sooner athletes visited the Sooner Racing Team to experience what it is like to be on the team! Check out the full-length video. Al Roker from the Today Show delivered a 34-hour long weather forecast for the Rokerthon 2 event. He visited all 50 states and stopped in Norman, OK to break two Guinness World Records, the largest human image of a cloud and a lightning bolt. Leading up to the event, he visited the Sooner Racing Team! 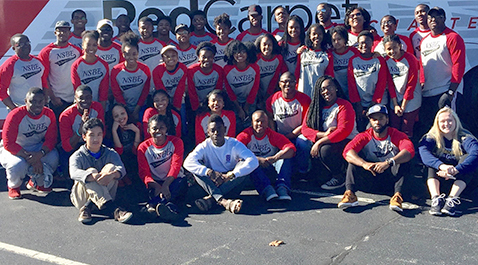 The GCoE National Society of Black Engineers (NSBE) is rebranding who they are and what they represent during the 2016-2017 academic school year. This year’s campaign is titled “The Re-Brand Year” and NSBE is specifically focusing on membership retention, professional development, academic excellence and strengthening the black engineering community. 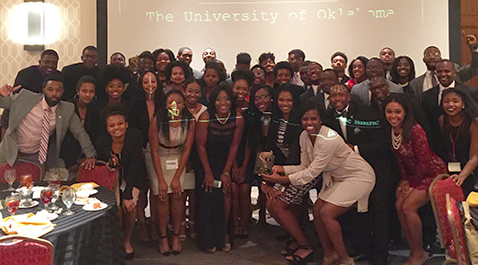 On November 11-13, the OU NSBE chapter traveled to Houston, TX for the Fall Regional Conference (FRC). Their trip was extremely successful and we’d like to take a moment to share details of their experience with you. During this trip, our chapter increased our participation in daily events offered and demonstrated great professionalism. As a reward for timeliness, professional dress and for being noticeably engaged in comparison to other chapters, the OU chapter was given exclusive access to the career fair ahead of 1000+ other students. We had several students receive interviews. Not only did we participate as a chapter in larger events, we also had 3 students compete in the Elevator Pitch Competition, 4 students in the NSBE Debaters Competition, 7 students in the Academic Bowl, and 6 students in the Talent Show. Witnessing “The Re-Brand Year” take effect beyond OU’s campus was amazing and it was even more amazing to watch our chapter compete well against other universities. For more information on GCoE NSBE, follow their Facebook page. During the past several months, the Boomer Rocket Team (BRT) has been working to design a rocket for the Spaceport America Cup, an incredibly competitive international rocket competition. To help achieve this, the Boomer Rocket Team’s fundraising campaign is being featured on OU’s Thousands Strong website. BRT is an engineering competition team which focuses on the design and construction of high-powered rockets. 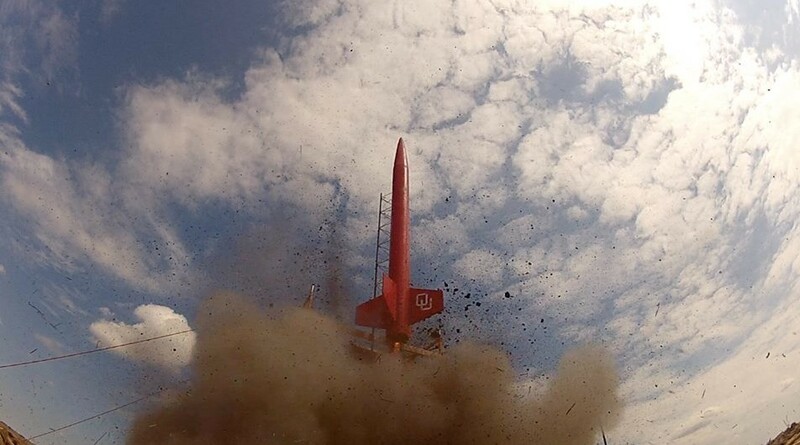 The team has 3 main goals: participating in rocket based engineering competitions, certifying members to fly individual rockets, and gaining experience in rocket design and manufacturing techniques. Each year, the team chooses one or more competitions to enter, challenging them to explore innovative changes to standard rocket designs. The goal of the BRT fundraising campaign is to raise $3000 in just over thirty days, ending on December 16th,2016. To give a donation or learn more information about the campaign, please visit http://bit.ly/2fndPbj. UPDATE: The Boomer Rocket Team has had an absolutely incredible first week! In 7 days, with 19 sponsors, we already reached our initial goal of $3,000. We want to send a huge thank you to all of our sponsors! Your contributions have made competing possible this year. However, we still have 3 weeks to go and we have no intention of quitting now! The Boomer Rocket Team is stretching its goal to $5,000 to help front the cost of participation in other competitions, and allow us additional design space for our Spaceport America Cup Rocket. We are very excited to see what the next 25 days bring us. Thanks to your incredible support, the team can push farther than we ever planned to. You can continue to help us by telling friends and family about our campaign, and sharing our link wherever you can. View photos of the segment on the AME Facebook page.